Hello Kitty Kitchen Cafe $59 + FREE Shipping (Reg. $80)! You are here: Home / Great Deals / Hello Kitty Kitchen Cafe $59 + FREE Shipping (Reg. $80)! 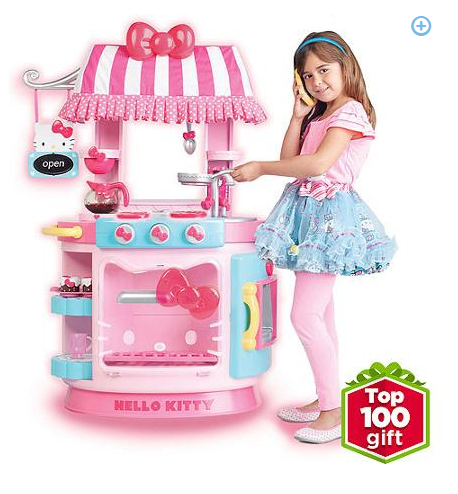 If your little Hello Kitty fan loves to cook, then be sure to check out this HOT Cyber Week deal! You can get this cute Hello Kitty Kitchen Cafe for only $59 + FREE Shipping (Reg. $80)! Includes a disappearing coffee pot, coffee mug, 2 cupcakes and serving tray/muffin pan, a removable oven rack, 1 pot, 1 spoon, 3 ice cubes and 2 menus for endless play! !